Mullah (/ˈmʌlə, ˈmʊlə, ˈmuːlə/; Arabic: ملا‎, Azerbaijani: Molla, Persian: ملا‎ / Mollâ, Turkish: Molla, Bengali: মোল্লা) is derived from the Arabic word مَوْلَى[verification needed] mawlā, meaning "vicar", "master" and "guardian". However, used ambiguously in the Quran, some publishers have described its usage as a religious title as inappropriate. The term is sometimes applied to a Muslim man, educated in Islamic theology and sacred law. 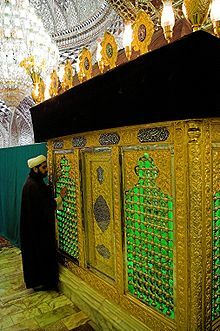 In large parts of the Muslim world, particularly Iran, Pakistan, Azerbaijan, Afghanistan, Eastern Arabia, Turkey and the Balkans, Central Asia, the Horn of Africa and South Asia, it is the name commonly given to local Islamic clerics or mosque leaders.